Coming up with cool horse names is so much fun. But there are so many to choose from! And sometimes it is hard to find the right one. I've asked other horsecrazygirls to share their ideas, and you'll find many here. Be sure to share your favorites in the comments below! I like this name because it is for an energetic horse. I love riding horses with a lot of energy! It's cute and country. Perfect for a gelding! I like Freedom Fire as a name because it reveals that its free and it's somewhat temperate. I'm just the kinda person who likes high-spirited horses. My horses name is "Close To The Stars" and his barn name is "Starsky" (Star-skee) I just think it's a really cute name! Lol! It is a line from a Country song and I think it goes good for a Stallion. Preferably Australian Brumby Black. I make up these crazy names but this one was really cool in my language (don't ask) it means "Vanilla Day." Yes do so! The Hoofbeat Quests is an amazing series about action, romance, mystery, and everything in between! I'm so happy we might get another HBQ fan! Here are some horse names from the Hoofbeat Quests! Hope these helped! PS: MUST READ THE HOOFBEAT QUESTS! Nobleman is a really good name for a stallion. I think, its cool. In the 'Tilly's Pony Tails' series by Pippa Funnell, Harry's stallion is Nobleman. NightStorm, Storm, Arabella (bella for short), Stardust, Mystic, Magical, Flame, Destany, Texas, Mischief Maker, Midnight Dancer, Midnight Fighter, Emerald, Pippin, Pipi, Goldrush, White Night, Star Glazer, Moonlight. Hope you like them, I am thinking about calling my new filly Arabella or NightStorm. Can't Decide!!!! I really like this name for a stallion, I think its rather sweet. My brother had a horse named Macaroni. He was a paint. "Yankee Doodle went to town riding on a pony, stuck a feather in his hat and called it Macaroni." As a small child, my grandparents had a horse named Ribbon. As a teen working on a ranch, my favorite horse was Big Red. Another horse they had was Whiz a Way Bar. They had many more but these were my faves. Hi, I just got two bay mini pony fillies. They are both uber small, and one of them is also very fat and fluffy. Please help me choose a name for them! I have a black and white pinto stallion. I was thinking Eclipse or Moonstorm. I also have a coffee brown mare with a darker brown mane and legs. I thought maybe Coffee n' Cream or Mocha. Finally, I have a blue roan mare who is very beautiful. Blue or Speckle but maybe a more creative name would be Starspeckle or Starsky. I like the name tiger eye because it sounds rustic and it’s not too long but it’s unique. I have always liked the show name "duke of neverland" with a barn name of duke. Although those aren't really colt-y. Also, I really like Dreamer's Stardust! Good luck! Looking for a name for a chestnut with a blaze. Don't know gender yet, but if its a girl we were thinking Stardust. Need ideas for a colt, though, and if its a colt it will grow up to be a harem wild stallion on Assateague island, VA (wild if its a mare too, but a wild stallion name has to have a different ring to it). The foal's dam's name is Dreamer's Gift, and sire is Ken, for reference. Both are chincoteague ponies not descended from Misty, and I would prefer to stay away from names like 'misty' 'phantom' 'stormy' 'twilight' 'sea star' etc. because those names are so common in the breed. We really wanted to have either Faith or Dreamer in the name. A 'registered name' would be preferable. I know this is hard, but we've run out of ideas for a colt/stallion name at all. Our filly names are Dreamer's Stardust or Faith's Stardust. Neither really work for a chestnut colt. I own my own Chestnut called Fudge and he is the love of my life. I have a few! P.s. this website really helped me. Hope you find some you liked! Okay so what is your horse's color? If it is bay, here are some ideas: Fireball, Flame, Mystic. If your horse is chestnut those names could also work but here are some more names: Warrior, Wild Wind, Triton, Jupiter, Chancey. Help I just got a new warmblood ant I can't think if a barn name. His show name is going to be foolproof if that helps. Hero, Magic, Pirate, Dasher, Prancer, Hollywood, Angel, Jinx Scooter, Rocket, Wonder, Memory, Summer Breeze, Chili and much more that are not in this comment. I think that Boots would be an adorable name for a miniature pony gelding! So cute! I have a paint horse. She has no stable name or anything. She isn't registered but her name is Wiley and I need help coming up with something clever for her instead of "Wiley the coyote". Thanks so much!! Help! I have a new horse and she’s a sorrel paint. Her name is ruby but I want to change it. Her registered name is Draped in Diamonds. Please, some suggestions. Thank you! Also, if you have an idea for my Breyer, could you please comment about it? Any ideas, guys? I was thinking of Warning as a name, but it just doesn't seem to fit. Help! I might be getting a horse soon, and she's a grey appaloosa with a snowflake rump. I've narrowed it down to 3 names, Drift, Powder (as in Snow) and Chicory(the wild flower) If you like one of the names and would like to help me, please type your opinion! Also don't be afraid to put up some suggestions too! Thanks so much! Hope you find the right name! I just got a horse for my birthday and I am so stuck. I don't know what to name him. He is a liver chestnut with a stripe. He is my miracle and I love him so much. Please list some unique names that might have meaning to him. Thank you! If you need more you can always ask. Ash, Rain drop, Mystery, Storm, Thunder, Mystic, Blaze, Flame, Wish upon A star (Wish/Star), Fortune, Chance, Willow, Night Star, Midnight, Dawn, Dusk, Twilight, Apollo, Pixie, Silver, White Fire, Blue fire, Black fire, Rain Drop, Kaya, Dangerous Flames (Flame/Danger), Never Give Up, Courage, Hope, One Last Chance, Wildfire, Wild, Wildheart, Flicka, Noblewarrior (Warrior), Cloud Watcher (Cloud), Thunder Walker, Storm Walker, Coco, Chocolate Chip, Caramel, Shade Of Grey, Starlight, Stardust, Nightdust, Sprinkles. Raspberry Pie, Pie pie, Cherry, Blossom, Cocoa Swirl, Toffee Apple, Milkshake, Mint. I hope these names are helpful! Hope you guys find the perfect name! I think this name is soooooo cute especially on a black Arabian!! If I had a dark black horse, I would so name it jinx! If you have a grey mare, I always liked the name Belle and then her show name could be "be my guest" from Beauty and the Beast. I like the name Tango, Cobalt and Neptune. I recently bought a dapple grey welsh pony named Blue. He needs a registered name. He is very sweet. We are gonna show in hunter. Show names needed please. I also like the names Hero and Smartie. My horse's name is Cortez. Cortez is a town in Mexico. My horse is a paint barrel horse. I love this name because it is happy and bright. I love these names so much! Cyclops is a good name for a one-eyed horse. Okay, so I'm struggling to come up with a show name for my one-eyed bay gelding, suggestions please! Key Largo from a love song by Bertie Higgins. A gorgeous Buckskin Dun - actually more of a palomino color, but she is a buckskin. NEO either for the "ONE" on the Matrix or what I call mine Night Echoes of Odin (A Norse God). He is a Mouse colored appaloosa with a full blanket. Black Pearl from the movie Pirates of the Caribbean. She is a black TWH mare. Delilah a song by Tom Jones. She is a Black Hackney pony. Dark Shadows from the Movie, a bay Azteca Mustang. Hope these help. I am still looking for a blue roan appaloosa with a full blanket and I would like to name him/her Broken Arrow or Edge of Night depending on horse-nality. I just rescued a slaughter bound horse from Oklahoma and had her transported all the way to Cali to live a spoiled rotten life of love. She is a beautiful Bay Mare with white socks and a star and snip. She is a Missouri Fox trotter and is all but 14.2 hands high and only 10 years old. I want to name her Karma. What do y'all think of that name? So I'm getting a blanket Appaloosa (black and white) and she's a mare, I've thought of some names but I would like to hear some new names, any ideas? Nightmare Moon and Black Legend are my favorites. Lots of these names come from other horse crazy girls. Thanks! I have a buckskin quarter horse gelding and he needs a name. He stands a little over 14.3 HH and his papered name is Lil Hollywood Suprise. Hi! I need names for a black welsh pony mare. I just bought a new horse in Howrse and I can't think of a name. :) Thanks for listening! I am looking to get a paint filly and need a name. I like Hawkeye for Blue eyes or Cochise without. Tell me what you think and I need more suggestions. Getting an endurance horse sometime in November :} hope to find a cool new name for it, any ideas? Very very cute and I think it's a beautiful name for a Buckskin because they are a bright yellow gold like the stars. And it's very great for a racehorse. I like the name Batman because it's energetic and has an opposite side, like a flash. I need a name for my 3-year old red dun. He came with the name Rio and I didn't really like that then I wanted Dunstan and it doesn't really fit him. I think the name Patriot is a good stallion name and I am most likely going to name my horse that. Name for a Bay TB Gelding? I have a new horse that is a 1 year old Appaloosa gelding and is literally covered in spots. He is whitish, grayish with black gray and brown spots. If it is possible, could someone help me with names? Thanks! I'm getting a palomino mare but her registered name is Bloom... What's a good stable name for that? Or a nickname that relates to it? Abby! Dakota! The best mare I've ever owned was named Dakota. I love this name for mares or geldings/stallions! I think it's best for a chestnut, palomino, or grey horse, but it's really great for any color. I think this is a great name for a high spirited horse. I just like to come up with horse names on my own time so here is what I have. Enjoy! I think Blazer or Star for boys and Lavender or Holly for girls. I live on a station! I love breaking in horse etc. But its hard for me to come up with names for so many horses! Here is a list of my horses names! So I'm getting a dun mare and I want a cute, sweet, innocent name. Can someone help? Here are some horse names i like! Boys: Thunder, Lightning, Storm, Charlie, Chance, Domino, Polo, Prince, Neptune, Pluto, Eddie, Billie, Archie, Apache, Comanche, Apollo & Oreo. Girls: Alice, Tilly, Rose, Rosie, Lily, Poppy, Jazz, Angel, Ruby, Garnet, Emerald, Opal, Toffee, Melody, Daisy, Pippa, Saffron & Sapphire. So I just got this new handsome stallion. He's a friesian. I'm stuck on names. If you could please help it would be awesome. Submit names for this handsome boy. I had a bay mustang named Paisley and she was one of the best things that happened to me. She was put down when I was 10 but I still love her day in day out. New horse! Need a name and show name! Please help! I just got a Connemara horse for my birthday a few weeks ago. His first name was Ale Gratis and I struggle to pronounce it so I want a really cool name and show name. She's a dapple Grey and is stunning. Please help! Sorry I don't have any pictures! Help! I need a really cool name for a chestnut mare. It is a beautiful horse but needs a HOT name. Any ideas, please let me know. I love the name chocolate kisses! My parents might get me a horse with a name already, but I need a cool nickname. I need help on naming a gelding! He's a palomino AQHA, a gelding, he is a great reining horse, and we just bought him. He's sweet, and gentle, and willing. He's twelve. I love him! But my parents and I are having a hard time naming him. I will post a picture of him, if I can. He's a beauty! My bff and I were trying to come up with a name for her new colt. The mom's name is Melody, but we don't know what to name the colt. It hasn't been born yet so we need male and female names. HELP! We need some good ideas. I actually have a bay mare named Luna Chicks and her stable name is Chick. She is actually the hand daughter of a famous barrel racer named Chicks Bedueno! I am very lucky to have Chick in my life. A cool name are Call My Agent, Galactic Tiger, Chain Linx, Wildside Of The Night, Wildside, Practical Magic, Partner In Crime, E.T./Entirely Terrific, Fiona's Magic Moment. I have a Bay Gelding QH and I am trying to name him, I was thinking Chance but I want something to go with it. PLEASE HELP ME OUT! I have a very great horse, he is very jung and very fast. He is British Thoroughbred and he is super cute and super smart and I really love his name Krespo. Hi, everyone! I have just bought a gelding that's got some paint in him and might have Thoroughbred not sure. But he has big blaze on his face with three big white socks and a splash of white under his belly and I can't figure out a good name to suit him. Cheers! You guys come up with great names. I like most of them. I love all of these! I know a gelding named Bently, he's at my barn actually. He's a big teddy bear. Lol! My horse's names are Pizzaro and Nitro's Fury. Beau is my horses name and it fits because he is BEAUtiful. Also I rode a horse named Sailor because his full name is YF Full Sail. These are names I am using for my model horses, I have spent the last hour finding names and meanings and putting them together to make the perfect names. Cool Show And Barn Names! I love this name for a horse "Shadow". The name Shadow is a great name for any horse but it would suit a horse that is jet black. There is ton more horses at Saddle and Sirloin but I can't think of them right now. I will get back to you soon with more names! I have a buckskin who is 16.2hh. He is super fluffy in the winter! His name is Duke. Haylee, Hugo, Grace, Barrels, Whip Nae Nae. I love the name Freedom Fire! I love that name because I have a horse named Kountry. I also like Syra because I have always liked that name for a horse. Apache is a great name for a darker bay gelding. The name fits my horse. Those are names that I have made up and heard about. I like Coco because it reminds me of the hot chocolate coco. Hello, I have no idea what to put but I just love this name so much I want a horse but I don't have one. Gotta Bounce For The Poa. I am a soon to be POA Pony owner (due to arrive in 10 months) but my problem is for registration purposes I have to have"Gotta" and "Bounce" in the name. Anyone have any ideas? This will be my first horse so I want it to be a good and special name but I'm just stuck! If I had a horse, if it was brown I would name it Cocoa. If it was white I would name it Snowball. If it was black I would name it Smoke. Snow and Snowflake you'll love them. My horse's name is Artsy and she is a Friesian mare her show name is Artsy Fartsy. I love all these names! Hope this helps! We are hoping for a colt from my sorrel mare we bred with a buckskin. I need names bad here's our ideas my mare's name is Smart Little Speedy Bar. Speedy for short. Our ideas: Don Juan, Buck, Bandeto, Cyclone, Thunder, Spurs. Please post names soon thanks! I love that name perfect for a show name. 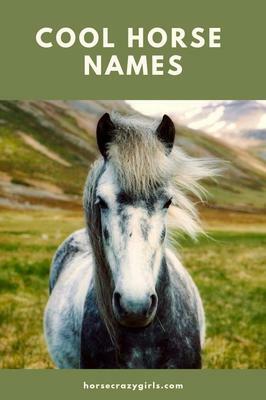 This was my mums horses name and I really loved it but I'm getting a Dun 13.2hh pony but it doesn't say its name on the article so maybe I'll be able to name him! So can you help me think of a name. I think that this would be a excellent name for a quiet mare because it is quiet yet alive name. I think that is a very pretty name for a female horse. I think Tinsel is a good name for a sparky horse and a horse that is very pretty. I like this name because I think it shows that my horse is brighter than the sun or something like that. My horse's show name was Black Tie Affair because he looked like he had a black tux on. We also called him Tux. In this list what I like the most is the name freedom fire. There is something special in that name. The name is energetic and powerful. I think it is a rare name also. I love it! My mares sire is named this. An energetic black stallion with a white crest. This is the best name for a horse like mine. Hey guys thanks for reading! Name of The Week! Name: Ebay OTHER: best for bay horses! My pony's show name is Holiday Gingerbread and her barn name is ginger. She is a palomino (I know it sounds like a chestnut name but it suits her golden color). Some names I really like! My favorite horse name is Leo. The first horse I rode was named that, and he's the best horse ever! He's chestnut with a blaze. I sometimes ride a Paint mare named Omni, which is cool for a horse that's kind of high-spirited like she is. I know a big chestnut, slow and steady, named Big Mack. A few others I like, based on horses I know-- Gracie, Passion, Copper, Toby, Zoey, April, Dakota, Finn, Magic. I am a soon to be horse owner!!! Very very happy about this. We recently remodeled my room and I have a chalkboard wall in my room now. All I've been doing is writing out names. My personal favorite that I found for a gelding is "Gage" kinda like a 12 gage gun. For a mare it would have to be either "Santana" or "Whiskey". There's a name that I absolutely love and happens to be the tittle of my comment this name could be used for both geldings or mares, "Cher Ami" this name means your friend in another language. I hope this helped with names for some. It has certainly helped me. Thunderheart... I think it is really cute and it implies a spirited horse with a lot of heart. Treble clef I like this name for a noisy or loud horse music may be a good one as well I also like the name trouble foray be a more ornery horse you can also say here comes trouble when the horse is lead to you or walks up to you. Cause when I'm riding I'm sitting on top of the world. Because it reminds me of a brown foal with a white star on her head or a baby doll. I have a horse called Herbie. He is on loan. I didn't name him but he suits that name. Just because its such a cool name! I think the name Scarlett is a great choice because it sounds mysterious and cool. My horse came to me with the name Madison and I thought if that was our show name we could go do a show in Madison Square Garden. That would be really cool! I like the name Duke because it's the name of my first horse, who is a Leopard Appaloosa! Starlight, magpie, buster, blackie, bobby - I chose all these names cause they are so cute! Cause it is the barn name of my Olympic jumper, a bay blanket appaloosa. His show name is the "Cloud in my hands" and he is great at dressage also. I think this is a great name if you have a pinto (or what ever you like to call them) because it looks like patches!!! Black Magic... Sundance... Ziggy... Sundae! I choose these names because they are all so cute!